Week 21 – What is a prodigal bike? It’s a second hand mountain bike donated to a small charity in South Somerset, refurbished and shipped to Africa. Children in Africa have to be really keen to get to school as it often involves an 8-10 kilometre walk – and school starts at 7am. Prodigal Bikes is an idea generated by a group of young engineering graduates at Westland Helicopters (Leolnardo) in Yeovil. The idea was simple, ask people to donate second hand mountain bikes which are surplus to requirement, refurbish them, ship to Africa, distribute them to school children to make it easier for them to get to school, and train local mechanics to repair them so that they can be kept working. 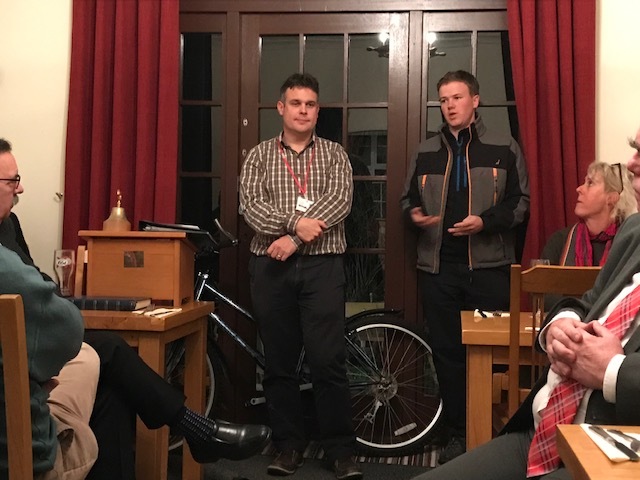 This week the three originators of this idea came to visit us at a club social evening and they brought a prodigal bike with them. The project started off with 26 graduate engineers refurbishing bikes in a workshop at Westlands, and now two years later they have set up a charity, shipped their first consignment of refurbished bikes to Kenya and have started changing the lives or young people in Africa. Everyone involved in this charity is a volunteer giving their time freely to refurbish bikes in their new workshop in Crewkerene. In their spare time they are developing relationships with partners who can help them ship the bikes and promote their charity. There is a lot more to this young charity which has ambitions to expand their activity into other African countries, and also to be involved with Community Payback programmes and disengaged people locally, working with them to refurbish the Mountain Bikes ready to be sent out to Africa. They give them a taste of working hands-on in an Engineering discipline, with a view to their pursuing education and careers in related professions. You can find out more about Prodigal Bikes on their web site.